But they discover a sinister cult who are eager to exploit Ally’s heightened senses. 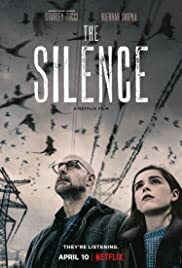 Based on the acclaimed novel, THE SILENCE is directed by John R. Leonetti (ANNABELLE) and stars Stanley Tucci, Kiernan Shipka, Miranda Otto, John Corbett, Kate Trotter and Kyle Breitkopf. Watch on April 12th, only on Netflix.